I’m pleased to see how many people read Rev. Paul Gaffney’s remarks in my last post. I even got a call from City Hall assuring me that Paul’s concerns would be addressed at the next meeting of the San Rafael homeless subcommittee. But I was sadly reminded Sunday that after years of meetings homeless people continue to die on the streets of San Rafael. They die, cold and alone, because too many in the greater community see them as eyesores and nuisances rather than brothers and sisters. 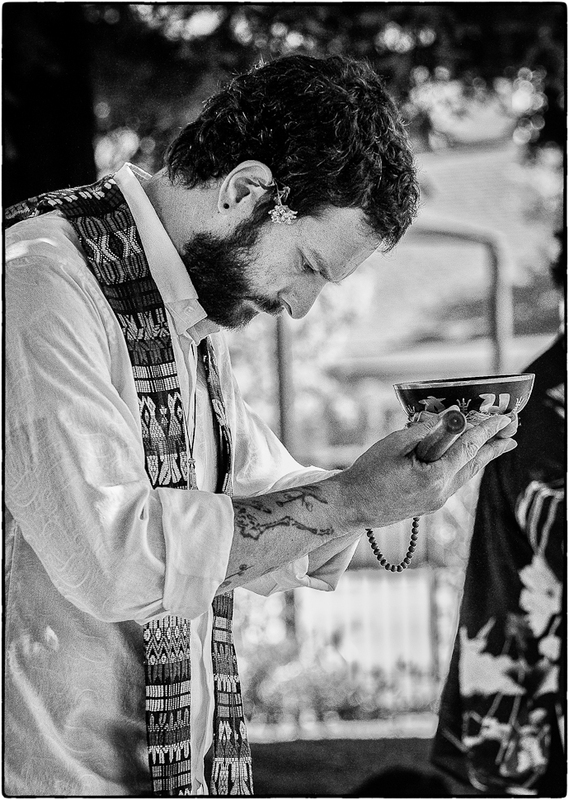 The Marin Interfaith Street Chaplaincy held its 15th annual Memorial Procession this past Sunday. The group met at Albert Park and walked to the St. Raphael Church in San Rafael. 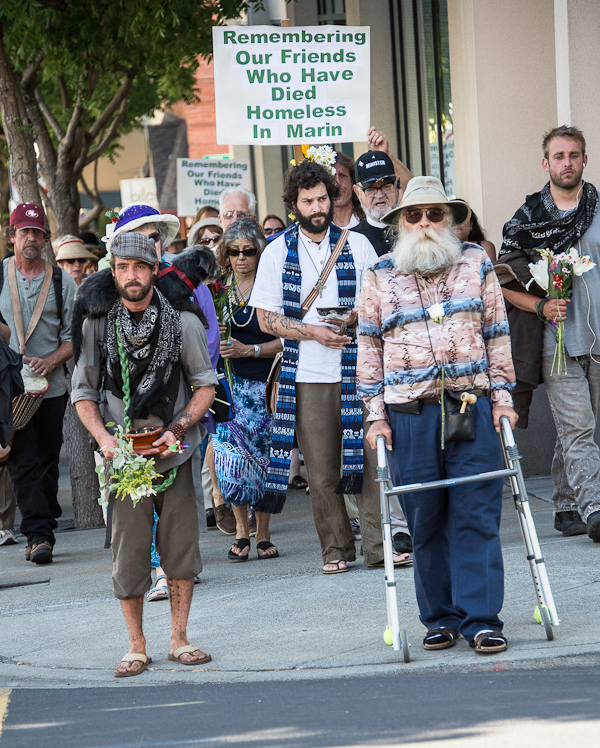 Memorial Procession in honor of those who have died on the streets of Marin County. The names of one hundred fifty-five people who have died on the streets of Marin County since 1995 were read and honored. I couldn’t stop wondering how many would be alive today if they had been offered adequate housing, or even a place to get out of the rain. Rev. Gaffney and Fr. John Balleza welcome those who have come to honor Brothers and Sisters who have died without shelter in Marin County. 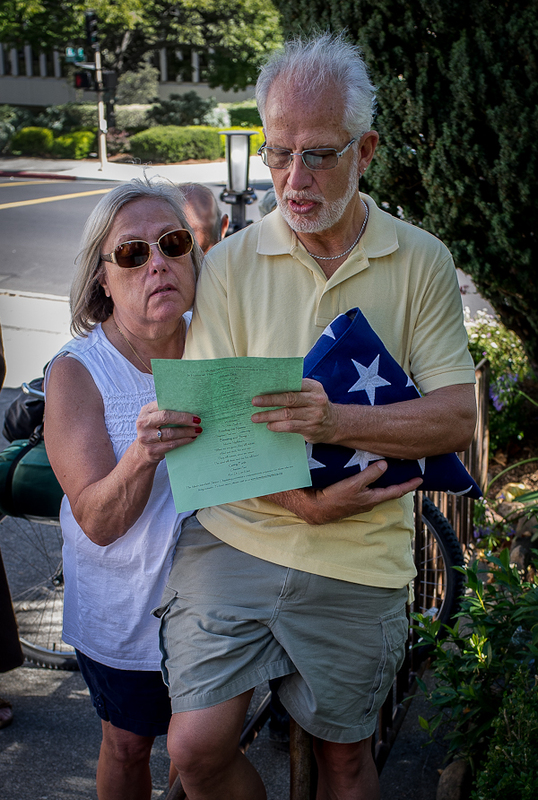 Reading the names of those who have passed on the streets of Marin County. Members of the community gather at St. Raphael Church to remember the dead. I’ve been told that the next meeting of the San Rafael homeless subcommittee will be more productive. Among other things, I hope they consider seeking funds from the business community to support a downtown outreach worker who could direct homeless citizens to appropriate services and help keep the streets welcoming to all. This resource person could be attached to the Ritter Center or St. Vincent’s. I attended the July 24th meeting of the San Rafael City Council’s Homelessness Stakeholders Subcommittee hoping to hear serious proposals for reducing homeless in Marin County. Instead, what I got was complaint after complaint about homeless people messing up downtown San Rafael. The panel of “stakeholders” was heavily weighted toward downtown business interests and their real agenda soon became obvious. Everyone took pains to sound politically correct, but it was evident that they had little understanding of the complex issues underlying homelessness or the faceless people they wanted out of sight of downtown visitors. The whole thing reminded me of a puppet show rather than a serious attempt to get work done on the larger issues. There was someone from the Chamber of Commerce, a banker, a shop owner, a publisher, and a community activist known for his disdain for messy streets. There was one formally homeless person, but no one currently homeless, or anyone who had much personal contact with homeless people. At some point I realized that “stakeholder” meant having a stake in getting the homeless out of downtown San Rafael. The San Rafael mayor and a council member were also on the panel but had little to say after admitting the city had little leverage when it came to homelessness. If I hadn’t know better, I would have thought this was the first meeting ever held about homelessness in Marin County. There was no mention of all the work that had been done previously by Marin organizations and individuals. Instead, an inordinate amount of time was spent tiptoed around the panelist’s obvious disdain for the chronically homeless who mess up “their downtown” and discourage paying customers. The discussion seesawed between repeated complaints about hurt business interests and the need for affordable housing. Someone in the audience finally mentioned that affordable housing was not the solution to downtown loitering. People sleeping in doorways were most likely never going to afford any rental units in Marin, one of the most expensive housing markets in the United States. Near the end of two hours, the audience was finally allowed a few minutes to share their views. The Rev. 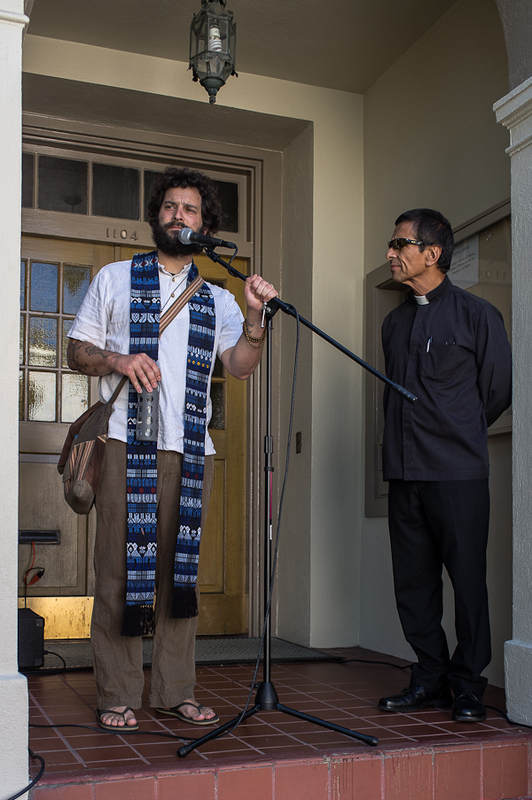 Paul Gaffney conducting a memorial service in honor of those who have died on the streets of Marin County. “I’m Rev. Paul Gaffney. I’m the chaplain on the street here in San Rafael. . . I’m feeling passionate about this right now. These are people that I know. You’re talking about the numbers and how much money we’re spending –and people are dying, tonight, out here. I don’t think it’s a mystery. My challenge to this group before the next time you meet, why don’t you go out there and talk to two homeless people, each of you. Talk to them, ask them what their story is. Why they’re’ out there, what would help them. What they need, what they want. What their experience is like. I hear their stories every day. These aren’t people who have just decided to drop out. These aren’t people who are lazy or causing problems just for the sake of causing problems. These are people who are hurting, they’re suffering, they’re in pain. And hurt people hurt people. OK? And I see it happen every day. For me, these kinds of meeting are really just …… I almost left a half hour in. 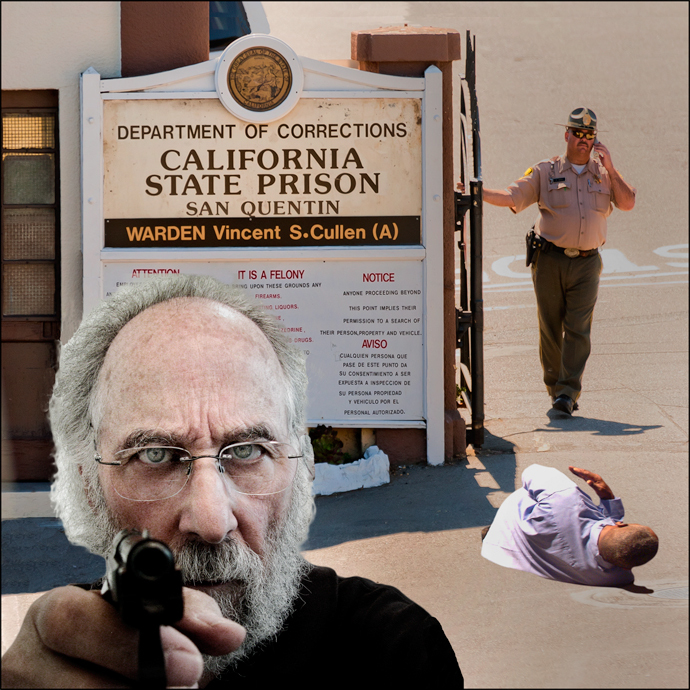 Because I can’t sit here and listen to this knowing that we’re not even catching it, like you know, these are real people, and when we sit around the table talking about them as if they’re numbers or as if they’re something on a page, or “it’s a problem that we have to address,” you know, these are citizens ……. And I think the way to start addressing this is to stop talking about them as though it’s a problem. Let’s look at it for what it really is. This is a part of our system. This is a part of the way we live. Homelessness is a reality. No one is going to make it go away. Not in San Rafael, not in Marin County, not anywhere. Because its the fallout from the way we live our lives and the way we operate as a society. These people are the costs of our way of living. So lets look at that. Let’s look at how we can do something about that. So it’s not going to cost you a dime. But the way to start this process, is to say to the homeless community, my brothers and sisters who are in the room right now, who are living outside, to say, “You know what? You’re here, we see you. We care about you. We want you to live the best life you can possibly live given the circumstance that you’re in” …… You do that and you ask the police department to be gentle to people, you give them a mandate to be nice to people, train them how to speak to people in a way that they don’t feel degraded or oppressed, and you will see, I guarantee you, you will see people being more respectful. You’ll see people not littering as much. You see people not standing in front of Starbucks being angry and acting out. Because they’re feel like they’re part of this city. It not’s going to cost you anything. It’s not going to cost you any tax dollars or anything out of your pocket to say to people we care. Once people feel cared for, the way that they act changes. And I know this for a fact because this is what I do every day. The people that you’re afraid of outside of Starbucks they give me a hug because I treat them like human beings. And I tell them that I love them. And I want the best for them. So, I think it starts there. You go down to Starbucks and talk to those people. Introduce yourself. ‘Hi, I’m mayor Phillips, how are you?’ That’s how it changes. It doesn’t change here. This doesn’t change anything, I’m sorry to say. I’ve been to so many meetings over the last eight years, and this doesn’t do anything. What does something is connecting with people. 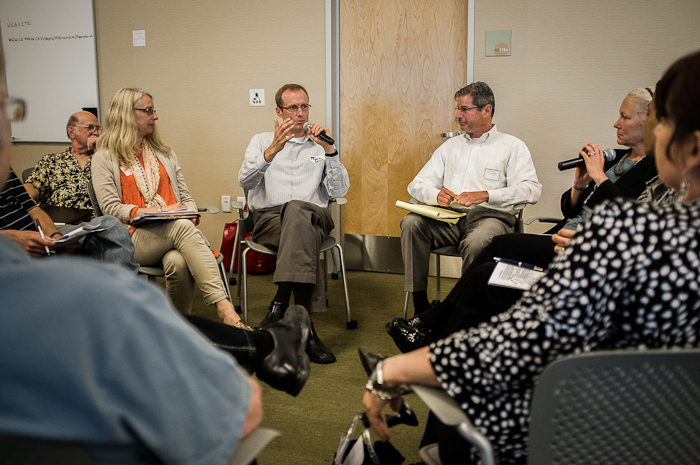 Marin County is taking another swing at reducing homelessness using an innovation called the Charrette process. June 25th, 2012 was the first of two days of intense dialogue between local and regional experts as well as the interested public. The program was facilitated by The Corporation for Supportive Housing, a national non-profit devoted to helping communities like Marin County find housing solutions for people living on the streets. For each of six problem areas (Prevention, Access to Services, Permanent Housing Options, Harm Reduction/Crisis Intervention, Criminalization of Homelessness, Chronic Homelessness), the experts sat in a small circle (“fish tank”), surrounded by interested members of the public. Each problem area was first discussed by the experts, and then the audience responded for an additional hour. Everything was recorded for further analysis and distillation. Local and regional experts discuss homeless solutions in Charrette fish tank. 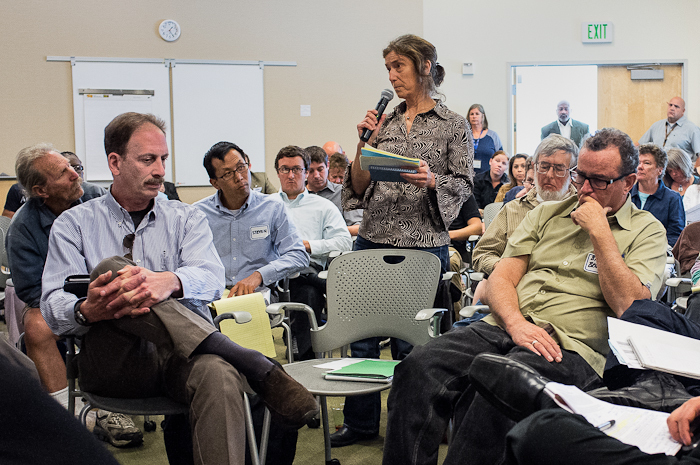 Members of the public use the Charrette process to propose ideas for reducing homelessness. The organizers took what they considered the best ideas and quickly produced a solution oriented plan. They weren’t starting from scratch because there are already many active organizations in Marin County finding some success in reducing the problems of homelessness. The goal, I think, was to find creative ways of doing an even better job, using approaches new to the local community. As I watched the process played out, the automatic cynic in me wondered if this is much to do about nothing, just a splashy rehash of what everyone in the field already knows. I hope this little voice will be proven wrong, and all the time and work put into the meetings will result in a new wave of energy devoted toward what often appears to be an impossible mess. The awkwardly titled resulting document, Framework to Inform the Marin Community Plan to Prevent and End Homelessness, is certainly filled with good ideas. Unfortunately, all this will cost truckloads of money, and the public will have to be convinced that dollars spent now will save many more in the future. One of the presenters mentioned that over the course of ten years a million dollars is spent on average for each chronically homeless person in the community. The point was made in various ways that increasing the stock of supportive housing would save a huge amount of money in the long run, and save many lives as well. 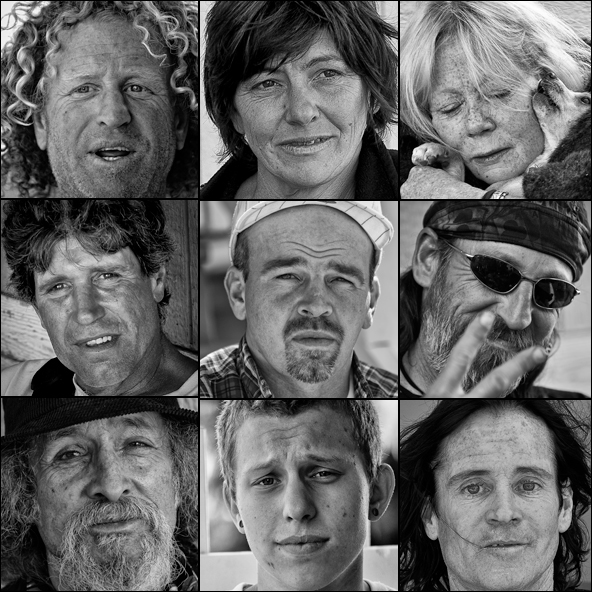 I’m most interested in the chronically homeless, persons who have been homeless for a year or longer and who are in some way disabled, often because of mental illness, alcohol or drug abuse, developmental disabilities, or severe personality disorders. It’s this portion of the community that consumes disproportionate amounts of police, court and jail resources. A Marin County count in January 2011 found 229 people who fit these criteria. About 143 of these homeless were sleeping outdoors or in abandoned structures. This seems low to me, just from the people I’ve seen moving about the Ritter Center this past year. 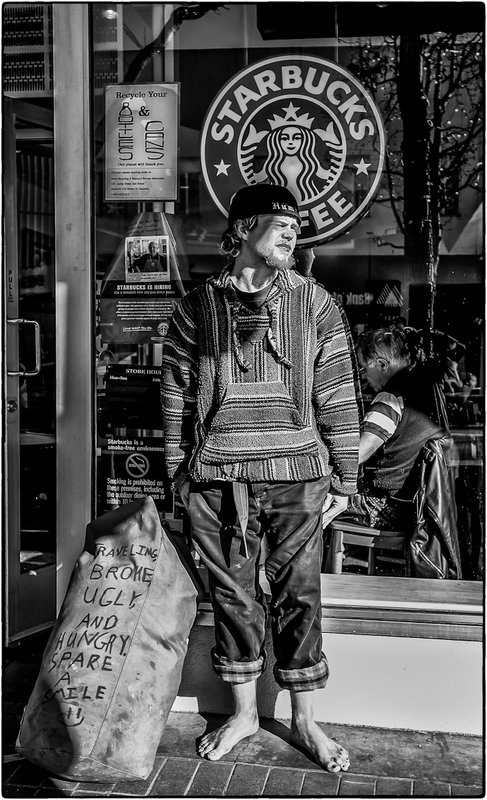 Street people in San Rafael, California. 6.1 Create a multidisciplinary team to link highly vulnerable people with housing and supportive services (including clinical, social, and community support services). 6.2 Develop options for permanent housing with flexible support services that are “right sized” to the individual, targeting individuals who are sleeping outside. 6.3 Incorporate Housing First strategies for all homeless service providers that see chronically homeless individuals. 6.4 Employ relationship building techniques to engage people in services and housing, helping them to maintain housing stability. Identify natural family and community supports to help people maintain health and housing beyond provider services. Keep the focus on the outcome of the relationship. 6.5 Use income generating techniques to help people gain access to benefits or employment. Rapid Access to SSI/SSDI and Supported Employment are effective methods for people who experience chronic homelessness. Consider ways to create entrepreneurial avenues for people who are inclined artistically and have other natural talents to build on. 6.6 Explore temporary housing models with local faith based institutions, which may include creating safe monitored parking spaces. 6.7 Ensure the County’s systems integration work for Mental Health, Alcohol and Drug, and primary care consider and prioritize services for chronically homeless individuals. 6.8 Integrate the County’s integrated services approach with housing for those experiencing long-term homelessness. 6.9 Advocate for housing and services strategies under AB 109 for individuals who need that support. 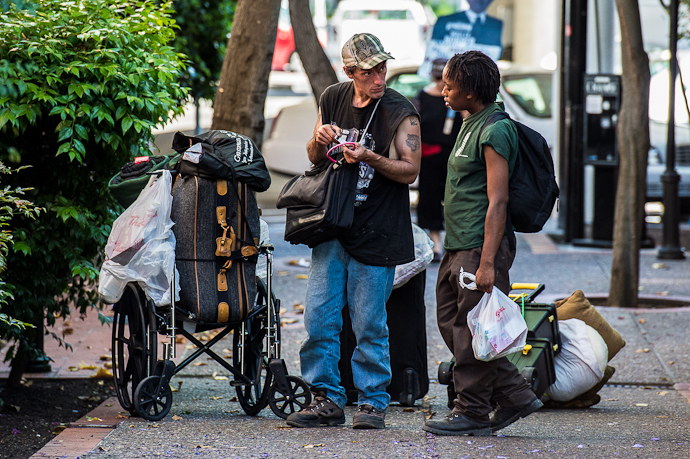 6.10 Consider creating a peer mentor program that employs formerly chronically homeless people to engage and support people who are currently chronically homeless to help them move into housing and more healthy living. 1. Have a multidisciplinary team in a roving van, making regular stops at known homeless gathering places. This van could make evening rounds, especially in bad weather, to take street people to safe overnight accommodations. This would be concurrent with the existing winter program. Extend the winter program to year round. 2. Find more effective ways of involving homeless people in decision making. Programs like the Ritter Center could have regular community meetings, encouraging clients to take a proactive role in their own welfare. Seek out natural leaders and help them to obtain mutually agreed to goals. 3. 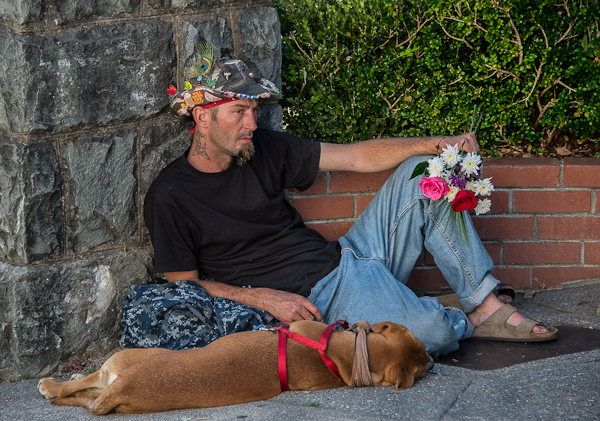 Create a simplified “One Stop” website, with easy access to all Marin County homeless services. This site could also provide a way for all stakeholders to share ideas. 4. Conveniently locate computer stations preloaded with resources likely to be useful to the homeless — some in libraries with trained volunteer helpers. 5. Someone should be keeping track of new research and the most successful programs in the US and around the world. These findings should be easily available and made attractive enough to insure regular review by the homeless provider community. 6. Consider appointing a homeless czar, someone to advise and coordinate homeless policy, someone who has the respect of the entire community. I nominate Dr. Joel Fay. 7. Give serious consideration to supporting a campground for street people who would otherwise be without shelter. Permanent housing plans are laudable, but it is inhuman to have people sleeping in the wind and rain until far-off solutions are obtained. Social service providers could visit the site daily, and strict regulations could insure sanitary and safe conditions. The campground could be on the grounds of Homeward Bound of Marin. This is not a new idea, and is being explored in other cities. 8. The San Rafael business community has long complained about street people hurting commerce downtown. An outreach team, funded by the business association, would help by directing street people to appropriate services. 9. A day center for the homeless, both wet and dry, would be helpful. This could be on the grounds of Homeward Bound of Marin. As I mentioned earlier, I was a bit skeptical of the Charrette process (old wine in new bottles) at first because most if not all reasonable solutions are already known to anyone willing to do little googling — but now I’m hopeful that the novelty of the Charrette Process will encourage renewed efforts at putting best practices to work in Marin County. The San Rafael City Council Homelessness Subcommittee , headed by the mayor, held the first of three stakeholder group meetings on July 24th. I’m hoping actionable goals can be set and implemented soon. There will be much chatter in the next few days about how to prevent similar horrors, but the NRA will probably have its usual way with our timid politicians, and after much hand-wringing, little will change. You might see a call to require warning alarms on theater exit doors. If you haven’t signed up (on the right sidebar) for automatic notices when I post something new, please consider it. It doesn’t affect anything other than massaging my ego. It lets me know that someone out there in the wide universe has seen my latest photos. No junk mail will follow. I’ve been following the activities of Occupy Marin, wondering where things were headed. From what I’ve seen, the answer is nowhere. Each time Occupy Marin rallies, the group gets smaller. Yesterday’s demonstration mustered 25 hardy souls, mostly, from the looks of it, old lefties whose faces have become familiar to me. When the group’s rallies became smaller last fall, I thought it was because the weather had become less predictable, and hoped that things would pick up once temperatures warmed, but this seems not to be. I think that this is because Occupy had nowhere to go except onto the political stage, recruiting and supporting candidates willing to run on an Occupy reform platform. Unfortunately, the strongest voices in the movement seem to scoff at the notion of reforming our rigged political system, preferring instead to dream of a socialist utopia, and unwilling to settle for anything less. So if I had to judge by what I’ve witnessed in Marin, I’d say that the moment has been lost, and barring some unforeseen energizing event, Occupy has seen its day. Yesterday’s event focused on Wells Fargo Bank. 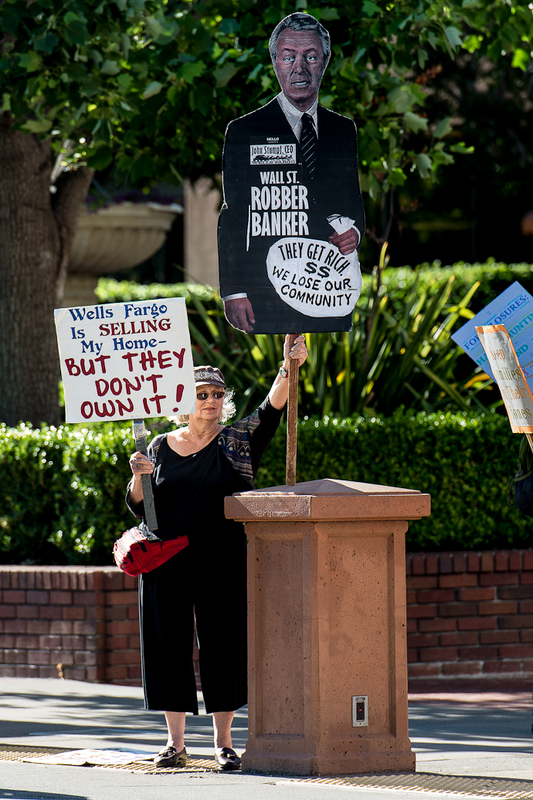 According to an article in the Marin Independent Journal, the bank is in the process of evicting a local couple from their home of 30 years. 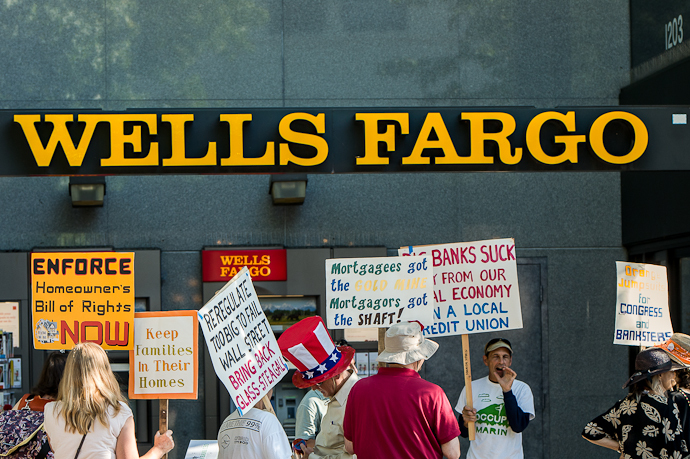 Occupy Marin is asking Wells Fargo to delay any further action until a new California law designed to give greater protection to people threatened with the loss of their homes goes into effect on January 1. The couple say they were talked into taking a second equity loan of $600,000 even though their house was appraised at $243.000. They say World Savings, who held the mortgage at the time, falsified documents so that the loan would be approved. 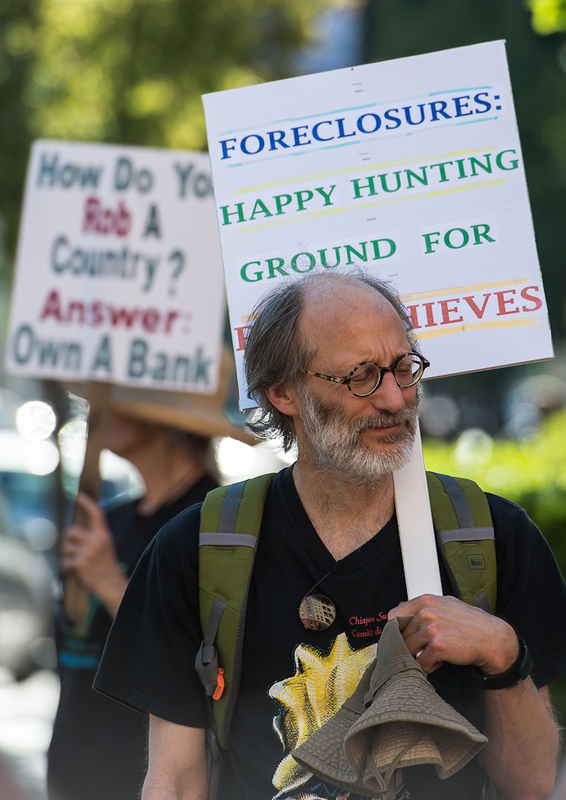 It’s easy now to say they should have known better, but still, given what we know now about widespread predatory bank practices, relief seems justified. Occupy Marin protest at Wells Fargo Bank. 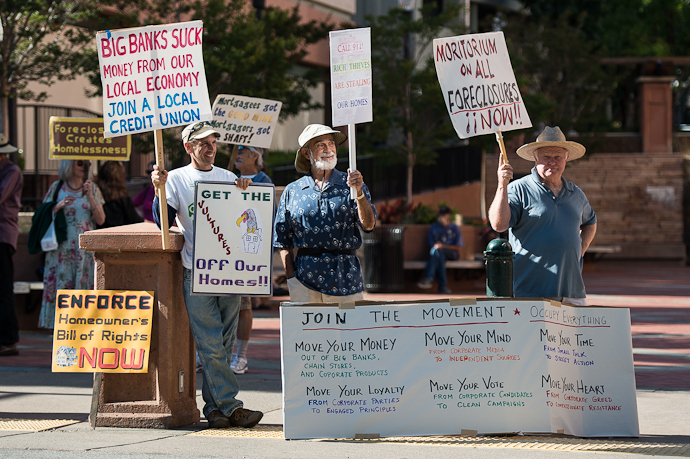 Some Marin protesters are clearly unhappy about predatory bank practices.